Whether the ceiling fans in your home aren’t working quite as they used to or you’re selecting ceiling fans for a newly constructed office, you’re going to want to ensure you select the right ceiling fans. Unless you’ve done this before, though, you probably have no idea where to start — and that’s totally OK! We’re here to help ensure you choose a ceiling fan that fits your style and your budget. At M&M Lighting in Houston, we are one of Houston’s top suppliers of lighting products and solutions. We take pride in our more than 50 years of business, and our lighting consultants are known in the community for their extensive knowledge and unrivaled customer service. Shop our collection of ceiling fans in Houston today, and if you need additional help after reading this blog post, don’t hesitate to schedule an appointment with one of our lighting experts. Below, we’ve listed our four tips that you should keep in mind when shopping for ceiling fans for your home or office. Well, first things first: figure out where you want to install your ceiling fan. Are you going to install it indoors or outdoors? Do you want it to be the main focal point of the space or will it purely serve a functional purpose of keeping things cool? At M&M Lighting, our ceiling fan collection has a variety of products that can accommodate almost any area or room in your home or office. Next, you want to ensure you choose an adequately sized ceiling fan to avoid some major interior design mistakes. If you choose a ceiling fan that is too small, it’ll look strange and won’t effectively serve its functional purpose. If it’s too large, it’ll make your desired area feel crowded and overwhelming. 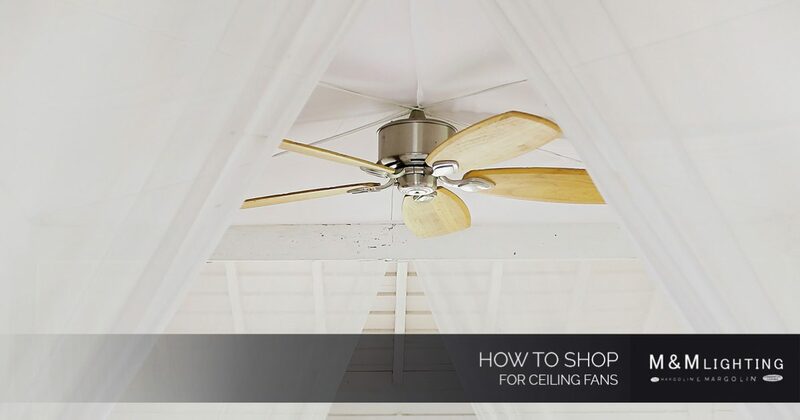 This part is a little more fun — you’ll decide on the style of your ceiling fan. Luckily, we offer an array of designs and colors in our ceiling fans collection, so you’re bound to find something that fits your preference. You can find a line-up of our favorite ceiling fans in this blog post. When worst comes to worst, we suggest taking pictures of the room or space where you want to install your ceiling fan. From there, you can bring those photos to our Houston lighting showroom and our lighting experts will be able to better visualize what you’re looking for. When you want a large selection of ceiling fans to choose from in Houston as well as lighting professionals who know what they’re talking about, choose M&M Lighting. We’ve been serving the local community since 1961, and we’re proud to be a top distributor of light fixtures and ceiling fans. Our lighting consultants can connect you with high-quality lighting products from the nation’s top brands that will last you for the long run — and will fit your desired budget. Contact us today to schedule an appointment. We’ll be more than happy to help you shop for your ideal ceiling fan!